This is a great time to promote summer program offerings with AFS! AFS is well into the recruitment season for our 2019 Summer & Global Prep Programs. Students who are new to study abroad or have busy summer plans might enjoy the shorter Global Prep programs that range from 1 to 4 weeks over the summer. Students interested in longer opportunities this summer might be interested in our summer programs ranging from 4 to 8 weeks in length! We have recently extended the deadlines for our 4-8 Week Summer programs until March/April. You can find updated deadline information in the Sending Programs Report: select 2019 and NH. Once you pull the report refer to the Submission Deadline column. The early action deadline for our Global Prep programs is March 1, 2019. Interested students should apply by this date for the best chance of getting their top choice destination! In New Zealand's indigenous language of Maori, the word Kaitiaki means environmental guardian, which will be the focus of the New Zealand Global Prep Program. Students will have the unique opportunity to learn about sustainability while experiencing the beautiful ecosystems of New Zealand. This 3-week program will include volunteer opportunities, interactive workshops, and seminars run by Department of Conservation and Indigenous experts who are passionate about environmental stewardship and sustainable tourism. The program culminates with the Festival for the Future, New Zealand's largest youth forum which brings students from around the world to exchange and develop ideas that can positively shape our future. Students will return home a kaitaki, a true guardian of the earth. Do you know a student who wants to learn Mandarin Chinese? With nearly a billion speakers around the globe, Mandarin is becoming quite a popular language to learn! This exciting month-long program to China offers participants the opportunity to learn Mandarin through daily language lessons while soaking up the culture through a local host family experience. After attending language lessons each day, AFSers will be able to practice their skills over dinner with their host families and participate in cultural activities like calligraphy, martial arts, and cooking classes. What a fantastic way to spend the summer! Just a friendly reminder that many of our Year and Semester programs are still open. Please encourage interested students to get started right away and contact us to fast track their application! How many of you allow your high school students to chew gum in class? I have never allowed it, but I am considering dropping the rule so I don't have to deal with it any more. Also, I feel like I am one of the few teachers at my school that enforce a policy against gum chewing and I don't need that to make me appear like I am extra strict or unreas...See MoreHow many of you allow your high school students to chew gum in class? I have never allowed it, but I am considering dropping the rule so I don't have to deal with it any more. Also, I feel like I am one of the few teachers at my school that enforce a policy against gum chewing and I don't need that to make me appear like I am extra strict or unreasonable. I don't want to fight that battle. Is gum being put on furniture a real concern? Is it outweighed by the benefits of better concentration being claimed for gum chewing? How many of you play music in the classroom? What subject and what kind of music? Any help from my fellow educators is greatly appreciated. The data is completely anonymous and only used for my Capstone. Thanks so much!! Hi guys. I am trying to get a feel for a new business venture that I am exploring. I have a PhD in Biology and Education Research and am looking to start a grading service for teachers/professors as a bit of a side gig. It would probably just focus on science for the time being and would include papers, lab reports, capstone projects, exams, etc. T...See MoreHi guys. I am trying to get a feel for a new business venture that I am exploring. I have a PhD in Biology and Education Research and am looking to start a grading service for teachers/professors as a bit of a side gig. It would probably just focus on science for the time being and would include papers, lab reports, capstone projects, exams, etc. The focus here is to help already overworked teachers catch up on backlogged grading and provide a sort of "virtual TA" service. 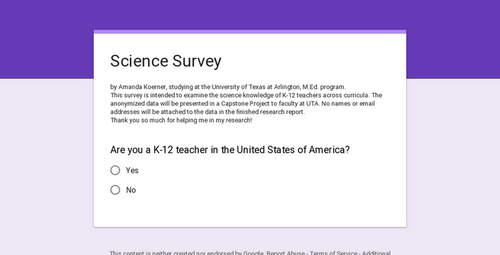 As a result I am looking for some opinions.....is this something that you think teachers would be interested in? Pricing thoughts? Best place to post/advertise these services? Just trying to gather some opinions, any help would be greatly appreciated. Thanks in advance! Where's the fine line on embarrassment? How do you know when it is appropriate to call a student out on something in class and when it's unnecessary? For example, if you are giving instruction and a kid is talking, you can stop and wait until they realize what's going on and stop. On the other hand, you could call the kid's name and tell them to stop talking. In the second approach the k...See MoreHow do you know when it is appropriate to call a student out on something in class and when it's unnecessary? For example, if you are giving instruction and a kid is talking, you can stop and wait until they realize what's going on and stop. On the other hand, you could call the kid's name and tell them to stop talking. In the second approach the kid gets embarrassed. It seems like teachers these days are super-sensitive about embarrassing kids. I'm not sure that it was this way when I was in school. So when do you call them over to tell them one-on-one and when do you call them out in front of the class? The fact is that sometimes you have to call them out. What's appropriate redirection and what is unnecessary embarrassment? haha Like I said. The line is more with the parent and/or the admin they will complain to. It's impossible to predict what an individual child will take offense with and/or go home and complain about so all you can do be reasonable and professional in your dealings with student. Occasionally calling a student out by name in the middle of class/a lesson,...See MoreLike I said. The line is more with the parent and/or the admin they will complain to. It's impossible to predict what an individual child will take offense with and/or go home and complain about so all you can do be reasonable and professional in your dealings with student. Occasionally calling a student out by name in the middle of class/a lesson, etc. is reasonable/professional as long as you don't make it overly harsh/personally belittling etc. (IMHO). Monty Your question reveals how much more sensitive teachers have become over the past few decades. It is difficult to draw the line between progress in ending the humiliation of students that was common in the past and overly coddling students who will find it hard when they leave classrooms and have to deal with the real world. I think there is nothing...See MoreYour question reveals how much more sensitive teachers have become over the past few decades. It is difficult to draw the line between progress in ending the humiliation of students that was common in the past and overly coddling students who will find it hard when they leave classrooms and have to deal with the real world. I think there is nothing at all wrong asking a student to stop a side conversation if it is done respectfully. Often all that is needed is to say the student's name. Anyone who finds that humiliating is overly sensitive. We all make mistakes and so we all need reminders from time to time to refocus our attention. A more subtle tactic is to just walk over close to where that student is. What one should avoid is betraying anger in saying a student's name or making jokes at the student's expense. I need to find someone who is currently working as a general education teacher with at least three years experiences. The interview will be 10 questions in text and it is for my class. Here are the 10 questions in case you are wondering what the questions looked like. 2. what is the key to being a good teacher? 3. what are most common accommodations and modifications have you used? 4. what are some of the more uncommon accommodations and modifications have you used? 5. Did you ever have co-teacher in your classroom? 6. If you have co-teacher then how do you work or get along with that person? 7. How do you prepare to write IEP for a student or have you? 8. What types of assessments have you used? 9. What are the biggest challenges you have faced in a classroom? 10. What are biggest successes you had in the classroom? My name is Danielle Smith, and I am a student in the Community Health Department at the State University of New York at Potsdam. I am working on an Honors Program research project with Dr. Brent Crow (PhD, CHES), also of the Community Health Department. The purpose of this project is to investigate assess school-wide access, attitudes, quality of s...See MoreMy name is Danielle Smith, and I am a student in the Community Health Department at the State University of New York at Potsdam. I am working on an Honors Program research project with Dr. Brent Crow (PhD, CHES), also of the Community Health Department. The purpose of this project is to investigate assess school-wide access, attitudes, quality of services, and staff coordination regarding mental health in high schools in the United States. If you are a principal or administrator, guidance counselor, mental health worker, student health services worker, teacher, or special education professional at a public high school in the United States, we could use your help in this project. Please note that your involvement is completely voluntary. Should you choose to participate, we would kindly ask that you complete the survey by clicking here: https://www.surveymonkey.com/r/FKYX8N3. It should take no more than thirty minutes, and your responses will be kept anonymous. Any questions may be directed to myself by sending an email to smithd198@potsdam.edu. Dr. Crow can also be reached for correspondence via email to crowbm@potsdam.edu or by phone at (315) 267-2124. Thank you very much for your time and your consideration. In an article I read, it was claimed that the US lags behind other countries in preparing students for STEM fields. Some of the main reasons why this is occurring according to the article is low proficiency results on tests which can be related to the small percentage devoted to more "difficult" concepts compared to other countries, lack of trainin...See MoreIn an article I read, it was claimed that the US lags behind other countries in preparing students for STEM fields. Some of the main reasons why this is occurring according to the article is low proficiency results on tests which can be related to the small percentage devoted to more "difficult" concepts compared to other countries, lack of training for STEM teachers, as well as pervasive inequalities in opportunities to learn among low-income schools and minority students. While all of these can impact the rate of individuals that go into STEM fields after high school, could the focus on "stronger curriculums" be overlooking the issues of inadequate educational opportunities for disadvantaged students? What are your thought on this?